Funny how this weather works.......throughout last year I was bemoaning the impact of the drought. It was hot. It was dry. It was one of the most challenging growing seasons that I've ever experienced. Now I find myself writing amidst a meteorological polar opposite, lots of rain, and do I mean lots! It is hard to complain; our lakes and reservoirs are back up to maximum levels and the ground moisture is being steadily restored. Maybe we humans find this precipitation pattern uncomfortable, but it is hard to fault rain! We had one of the best of winters and springs for transplanting. We installed a wide selection of woody species in the beds surrounding the Ruby C. McSwain Education Center, the newly planted containers around the Center and on the roof are super this season, our direct seeded "rooftop of color" in the footprint of the eventual Perennial Border extension grew at record speed, and the Annual Plant Trials and Demonstration Area had one of its best post-planting establishments ever, leading to a successful Field Day in July. The first half of 2003 was a season of awards for the JCRA; awards of national merit and awards to support new efforts. The Garden Writers Association of America (GWAA) recognized us directly and in concert with one of our publication partners. The "25th Anniversary JCRA Newsletter" received the 2003 GWAA Garden Globe Award of Achievement in the "Overall Product-Newsletter" category. Kudos to our own Chris Glenn for his editorial production of this issue. We were also recognized with a Garden Globe Award in the "Brochure" category for our contributions to NC Cooperative Extension's Successful Gardener publication. It won for the cumulative 2002 series of monthly issues. Each month, the JCRA is featured on the front page of Successful Gardener, with "ghost authoring" contributions from JCRA staff writers. We are grateful to Leah Chester-Davis, Successful Gardener's editor, for this partnership with whom we share this notable accolade! These awards are quite significant as there were hundreds of entries at the national level, including major well known publications. The next national award was of the proposal type, this time coming from American Association of Museums/Institute of Museum and Library Sciences. The $3,000.00 award came from their Museum Assessment Program. With the help of an outside consultant, this award is allowing us to review the ways we reach out to our clientele groups, to provide outside perspectives on our internal literature, brochures, and any other mechanism to present the JCRA to visitors, students, and the industry. It will be great to get these insights from someone outside our boundaries. Thanks to Donna Phillips, the Annual Plant Trials and Demonstration Area, the container gardens, and the lawn looked exceptionally nice this summer. Now onto what I'll call the "good news/bad news" department. In spring of this year, the University's struggling financial picture worsened and had a direct impact on us. We were literally just about to start our interviews for the vacant technician position when all such vacant positions were frozen. This, of course, is a critical position for us, since the technician assists greatly with all facets of Arboretum operations. The position remains frozen. As for the good news, we received word that Harold & Noel Lichtin of Raleigh decided to initiate a summer internship in the name of a family friend, Ben Anderson. This half-time internship was filled by one of our own students, Sara Millar, and she has been a great asset to the JCRA! Additionally, we have a special summer position for another student who works jointly with the JCRA and the Horticultural Field Lab, with particular responsibilities in all areas of seasonal "color" throughout the JCRA. Donna Phillips is an exceptional student for this job and special thanks goes to the North Carolina Commercial Flower Growers Association for contributing to this position's salary. Donna's efforts led to magnificent container gardens and perfectly manicured areas around the McSwain Center. She was ably assisted by the "Monday Evening" gardening volunteers who relished in weeding and deadheading. Please read more about Sara and Donna in our June 2003 and July 2003 e-Updates available on the Arboretum's Web site at <www.ncsu.edu/jcraulstonarboretum>. These and our other summer student assistants, Lee Davis and Judy Morgan-Davis, were key to keeping up with our summer outside, particularly after this rainy one! Some of our best interactions of the past months were exemplified by the North Carolina Association of Nurserymen (NCAN)/North Carolina Landscape Association (NCLA) Workday, our undergraduate student projects, and new initiatives for our volunteers. The Workday pulled together members of the nursery and landscape industries and our faculty who designed, prepared, donated materials, and installed a much needed landscape project directly in front of the McSwain Center. Be sure to read Nancy Doubrava's account of this project in this issue. The valuable direction of professors Pat Lindsey, Ph.D., and Anne Spafford, M.L.A., led to the design and construction of new vine supports in the Annual Plant Trials and Demonstration Area and the design of the new Contemplation Garden sponsored and design-assisted by Priscilla Swindell. Look for the Contemplation Garden to materialize on the right side of the pedestrian gate from the Beryl Road entry. 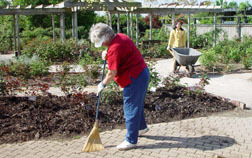 Finally, several new gardening groups of volunteers swung into action this season....in a short time, their value has already been proven to us; look for Frankie Fanelli's report in this issue. You can read much more about the 2003 Gala in this newsletter, but now, months later, suffice it to say it was a major success! As I greeted each and every guest through our gates, it was a pleasure to see this event becoming one for everyone; with relaxed and eager faces being the common denominator, our guests enjoyed the day in casual, formal, garden, and unique attire! Yes, the Gala is for everyone who supports the JCRA and we are planning for 2004 already! Many new milestones were achieved in terms of number of guests and silent auction items, brand new event logistics, and volunteer involvement. Donna Walker's leadership was key. Everyone is always interested in "how we did...." and for good reason. The numbers have been sent to all members under separate cover along with the breakdown of the disbursements. For the past two years, I've standardized the allocations of Gala revenues. We are bound to place $20,000.00 back into our Development support system and they are dollars well spent. Of the remaining $42,000.00, I have directed $10,000.00 towards building our overall Endowment and $32,000.00 towards the support of our general operations, maintenance, and positions needs. The 2003 Gala will go down as one of the best and thanks to everyone who came, helped, and sponsored it! Our staff has presented papers in the trade show and conference circuit this summer, including the nationally recognized Southern Nursery Association meetings and the Ohio Florist Association which is including much more landscape-oriented emphasis these days. Jon Roethling visited a selection of Pacific Northwest nurseries in August to exchange ideas and plants. And while I'm on the topic of staff, congratulations to Bernadette Clark for receiving an Outstanding Staff Award from the College of Agriculture and Life Sciences. Bernadette helps manage our annual trials throughout the year and truly does an exemplary job! On the research front, there have been several projects working in the JCRA background and worthy of mention. Peter Conden is a departmental graduate student and recently published two papers in the Journal of Environmental Horticulture with co-authors Frank Blazich, Ph.D., and Stu Warren, Ph.D. This JCRA-supported research focused on Castanopsis propagation and nitrogen nutrition of Ternstroemia. Jim Moyer, Ph.D., and Liz Parks are using JCRA plant materials to develop new technologies for cultivar identification and monitoring in breeding programs. Finally, our own Paul Fantz, Ph.D., has slowly but surely been taking hundreds of voucher specimens from the JCRA to deposit in NCSU's own herbarium as well as that of the U.S. National Arboretum. Voucher specimens are like botanical standards by which other scientists identify/verify unknown specimens of their own. Thank you, Paul. I cannot really close without a special note of thanks for your response to our first Annual Fund appeal. Your generosity, over and above your regular membership, has made our financial climate more comfortable and I'd like to express my appreciation on behalf of the entire JCRA staff! I'd like to close my letter by reiterating that any success we enjoy here is a direct result of our staff, members, and our volunteers; our plant collections are in good hands! Connoisseur Plants are rare new plants or hard to find old favorites, and they are part of the annual appeal and membership drive to benefit the Arboretum's many fine programs and its day-to-day operational expenses. These wonderful plants are sent to those who join the JCRA at the Sponsor, Patron, Benefactor, or Philanthropist levels. Please consider joining at one of these levels, or if you have already renewed your JCRA membership this year, you may increase your gift to one of these levels to receive the Connoisseur Plants! For more information about the Connoisseur Plants Program, please call Donna Walker at (919) 513-3826 or visit the Arboretum's Web site at <www.ncsu.edu/jcraulstonarboretum>. A detailed listing, complete with plant descriptions and photographs, of this year's Connoisseur Plants will be posted on the site in November. The JCRA e-Update is a concise monthly online update sent to Friends of the Arboretum members. It is full of interesting news including upcoming events and new developments at the JC Raulston Arboretum. There are also many electronic links to fabulous pictures and additional information. View previous e-Updates on our Web site at <www.ncsu.edu/jcraulstonarboretum>. Do you want to receive the new monthly JCRA e-Updates? If you are a Friends of the Arboretum member and would like to receive the JCRA e-Updates via e-mail, please contact Heather Chapman, JCRA Secretary, at <heather_chapman@ncsu.edu> or (919) 515-3132 to update your e-mail address. Receive free Arboretum announcements via e-mail from Bob Lyons, Director. Stay informed about developments and upcoming events at the Arboretum by subscribing to the Lyons' Den via the Arboretum Web site at <www.ncsu.edu/jcraulstonarboretum>. All new members are automatically subscribed to the Lyons' Den. Any existing subscribers may change their e-mail address anytime directly from the Web site. Designing and installing new gardens is one of the next challenges at the Arboretum ever since the completion of the Ruby C. McSwain Education Center. Unfortunately, fine gardens do not happen overnight, and all gardens benefit from planning and a good design. Last fall, Bob Lyons met with representatives from the North Carolina Association of Nurserymen (NCAN) and the North Carolina Landscape Association (NCLA) to discuss how to tackle several of the most difficult post-construction sites at the JCRA. The planning team was chaired by Mark Peters and included Ron Gelvin, Bob Lyons, Scott Myatt, and Peggy VanDevender. The solution: resumption of a past tradition at the JCRA, the Industry Workday. The project began in earnest as a particularly difficult site to landscape was identified near the Ruby C. McSwain Education Center. This area was directly to the right of the entrance walkway to the Education Center and presented particular aesthetic, planting, and maintenance challenges. The project was kicked off by the installation of a subsurface drainage system, soon followed by the development of a cohesive landscape plan. The professionals made it all look easy. In early April, eight to ten people worked three long days to install the hardscape. The tasks were numerous and included grading, bed preparation, and placement of the boulders and stone steppers. An irrigation system, complete with a state of the art weather station was installed. Visitors will be able to take a closer look at the future plants in this area from an attractive bluestone and river rock pathway. Plant beds were mulched. Sod installation followed taking several additional days to give the final touch to this project. Finally, a stone path was installed through the turf area inviting access. Valued in the range of $15,000.00 to $20,000.00, this project represents an enormous donation of time and materials. "It was really fun to be a part of the design process and to be able to make this volunteer contribution," said Mark Peters, JCRA Board President, NCAN President, and chair of the committee responsible for this project. The most challenging parts, according to Mark, were first identifying the donors and then facing the logistics of delivering all the donated materials to the JCRA. With the weather cooperating, the installation went very smoothly. Now as we enjoy these newly created spaces, we can begin to dream about the plants soon to be installed here by the JCRA staff. These gardens certainly promise to be intriguing areas, always representing the partnership between North Carolina's green industry and the Arboretum. NCAN for sponsoring the drinks, snacks, and lunch breaks and to Ron & Bev Gelvin and D. J. Gottschall for coordinating that effort. The Japanese maple arrives at the Arboretum. Left: Mitzi Hole digs the Japanese maple so it can be moved again. Right: Anne Calta and Bradley Holland prepare the planting area. The newly planted Japanese maple in the Opha Mae Powers Parking Circle Garden. It is hard to find a tree much finer than a red lace-leaf Japanese maple (Acer palmatum Dissectum Atropurpureum Group). Now, a stunning specimen, the symbol of the Arboretum, welcomes visitors to the JC Raulston Arboretum from its new home, the Opha Mae Powers Parking Circle Garden. It's an interesting story how this particular tree found its way to be growing in this place of honor in front of the new Ruby C. McSwain Education Center. The story begins nearly thirty years ago when the incredible specimen we see today was only six-inches tall, and hardly able to fill a quart container. It was then, that a friend of the Arboretum, Ed Alexander, received it as a special birthday gift. Over the years, he nurtured this tree, being sure to always take it with him during the many times he changed residences. Unknowing its ultimate destiny, J. C. Raulston noticed this tree and commented on its true beauty during a visit to Ed's garden many years ago. He knew he had something special. In 2001, Ed moved again, this time to a new home with no room for this now mature Japanese maple specimen, nearly 8' tall with a 10' spread. He contacted the Arboretum, proposing it as a generous gift for the new Ruby C. McSwain Education Center grounds. "With its graceful, sweeping form, we knew once we saw it, that it had to come to the Arboretum," said Todd Lasseigne, Assistant Director. 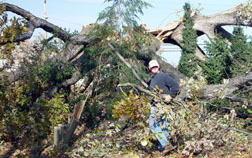 Moving a tree this size to the Arboretum in October 2001 was an enormous feat, especially without a tree spade. Bradley Holland, supervisor of Horticulture Field Laboratory, and his crew began the day by digging a hole around the perimeter of the tree's root ball. When Mitzi Hole's staff arrived with additional equipment, the roots were undercut using a chain. The tree was then removed and pulled onto a trailer for transport. "It was incredible! I'll never forget following the tree down Atlantic Avenue, watching its branches hanging over the trailer and into the next lanes," recalls Anne Calta, Horticultural Technician. 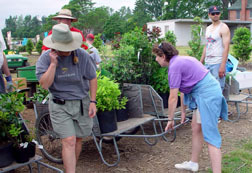 It was successfully brought to the Arboretum's nursery from Rolesville, NC and held there for over one year during construction of the Ruby C. McSwain Education, waiting to be planted in nothing less than a prominent location. In November 2002, this outstanding specimen was one of the first trees to be planted in the new beds in the vicinity of the McSwain Center thanks to the expertise of Mitzi Hole, Bradley Holland, and Anne Calta. It is planted on a raised site not only to showcase its beauty, but also to avoid any perched water table that might exist on this site. Thus continues the tradition that a Japanese maple tree can be seen from any point in the Arboretum. Japanese maples are relatively easily grown, according to Todd Lasseigne. Provide them with a fertile, but well-drained soil, and avoid standing water or "wet feet" on the planting site. Remember, the more cut or dissected the leaves are the more water the plant will require. 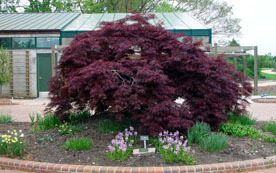 Japanese maples can be grown in full sun to part-shade conditions. Heavy shade is usually not recommended. Plants grown in shade will tend to be taller and more open than those in sun. If there is one thing that is constant at the JC Raulston Arboretum, it is change – change to existing gardens; change of plants throughout the Arboretum; and change in design or layout of the Arboretum. In these three regards, prepare yourself to see many things happening in all of the above areas over the coming year. Already, the first half of 2003 has seen much activity all around the Arboretum, ranging from continuing revamps of gardens and plant collections to the installation of new plantings in areas now open to us following the completion of the Ruby C. McSwain Education Center. In this article, we will discuss both items that are already underway, as well as some of those for which plans are in the works. Sitting at the core of these changes, however, are the plants here at the JCRA. Unlike most other botanical gardens and arboreta, we employ a rotating collections policy, wherein plants come in, are examined, and are later removed. The reasons for removing an old plant from the Arboretum are as complicated as are the ones for bringing in a new plant. Suffice it to say, however, that many areas of the Arboretum were in need of refurbishment, and we have taken this task as one of our top priorities for the year. Anne Calta clears debris from the fallen Quercus alba. Of course, on December 5, 2002, we were hit by an unexpected, and unwelcome, event – our record ice storm. Besides losing many significant specimens – including the old white oak (Quercus alba) in the Southhall Memorial Garden, three specimens of dwarf loblolly pine (Pinus taeda 'Nana'), the superb Tanyosho pine (Pinus densiflora 'Umbraculiformis') in the Japanese Garden, and a host of other plants – many other trees were badly damaged, but not lost. In particular, the storm broke the entire top 2/3 of the beautiful specimen of smoothleaf maple (Acer oblongum) in bed E14 and the Guatemalan sugar maple (Acer skutchii) in bed E43. Both of these trees are rare enough to merit special attention to bring them "back" to their previous form. Therefore, Jon Roethling has reworked both trees to select a secondary branch that will become the new central leader in time. 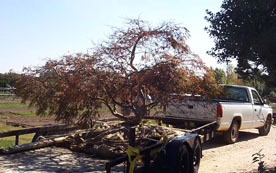 An Arboretum "classic" also suffered heavy damage – the Japanese Garden Japanese crepe myrtle (Lagerstroemia fauriei). When the tree started flowering in mid-June, the branches, already laden with the abundant growth afforded by this spring's near perfect weather conditions for plant growth, were practically touching the ground, blocking access to the Lath House and Japanese Garden. Today, it stands in much better stead, with pruning work done by Jon and Sara Millar (2003 Ben Anderson Intern) to "lift" the secondary branches, remove deadwood in the crown, remove the abundant water sprouts resulting from the ice damage to several main trunks, remove crossing branches, and direct branches away from other significant nearby specimens. The pruning work on the Lagerstroemia fauriei in the Japanese Garden also affords us the opportunity to start reworking plantings throughout the Japanese Garden beds, where many of the plants have outgrown their sites or gone into decline. Removal of several large Japanese maples (Acer palmatum), several plants of Nandina domestica of doubtful cultivar identity, several miscellaneous (and partly out-of-control) vines, and the mass of Liriope taxa (all grown together in a hopeless tangle) will allow us to begin reshaping this important garden within the Arboretum. With the shade cast by the L. fauriei specimen (now vastly larger in size than when it was transplanted there in 1982), we will be able to take advantage of these conditions to grow shade-loving plants such as camellias and Epimediums when the Japanese Garden is replanted. Lynn Scott (left) and Qian Wu (right), both part of the Thursday Gardening Group, mulch the Finley-Nottingham Rose Garden. One area of importance over the last few months has been to start involving volunteers in some of the nitty gritty garden maintenance work of the Arboretum. 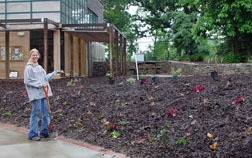 Due to the wet winter and spring of 2003, we were unable to mulch the Arboretum to the extent that is normally done. As a result of this, the weeds had begun to compete in height with some plants in the collections. This lasted only until one of our Thursday "Gardening Groups" made a few passes through the Arboretum. Included with the weeding has been the monumental task of removing much of the English ivy (Hedera helix) scattered throughout the Arboretum, since the original cultivar identities of many plantings of our English ivy collection are now lost. Trailer load upon trailer load of Hedera has left the grounds, much to our delight. This has allowed us to regain control in many areas and begin the process of planting these long neglected areas. Thanks to our volunteers for jumping right in and doing a fantastic job on these not so glamorous but pivotal tasks. Behind the Japanese Garden exists a portion of the Arboretum known informally as "China Valley." Representing one of the few intact remnants of the former West Arboretum, there are plenty of cool plants to seek out inside this part of the Arboretum, all in relative seclusion compared to other more open parts of the Arboretum. As with other areas, however, China Valley was in need of much work, and with Jon and Sara and the hurricane-like "Gardening Group," one day's work left a huge impact. They limbed up the Cryptomerias along the back wall of the Japanese Garden to let some much-needed sunlight in, weeded, pruned dead limbs from plants stricken by the drought of 2002, and, as mentioned, removed much of the ubiquitous Hedera. The goal in renovating this garden is to bring in more sunlight, remove redundant plants, and continue new plantings of species from Asia. Many of the plants currently growing there hail from the 1985 expedition to South Korea, of which J. C. Raulston was a participant. One of the plant collections that was in need of dire attention was the Baptisias (wild indigo), most of which grew in beds W11 and W12. These plants, dating back to the late 1980s to early 1990s, had been with us for many years and annually present a magnificent floral display of blues, whites, yellows, and purples. This all occurs in an often neglected corner of the Arboretum, the southwestern end of the West Arboretum. However, with these plants now in full view of the McSwain Center, we decided to give them a bit of a dressing up – e.g., labeling those existing plants to see what we had. To our horror, we discovered that there were seedlings galore, all probably representing unknown hybrids, and in some cases these hybrid plants being almost as large as the original, mother plants. After deciding which plants were the "real McCoys," we marked the remaining lot with red flagging tape, and "remove red-flagged Baptisias" was quietly put on Jon's work list. Well, if you've never dug up a Baptisia, then you really have no idea what was involved in slipping these few words onto a work list. Neither of us realized how extensive a root system these "innocent" little herbaceous perennial plants possessed, but after slamming in our shovels with brute force to break the leathery, thickened roots (which we initially thought were coming from some tree nearby), we now know that we'll never remove any Baptisia again unless it is absolutely necessary! Jon Roethling (left) and Sara Millar (right) clean up the Nandina collection. Early in the spring of 2003, Jon and Sara began the monumental task of bringing the Nandina collection back into control. Regarded by many as the best collection of Nandina domestica cultivars in the U.S., revitalizing and regaining control of this collection was considered a must. Unfortunately, removal of the English ivy that had crept into the collection was only one layer of the process, both literally and figuratively. Jon and Sara consulted both old maps and cultivar descriptions before they diligently removed unnamed Nandina plants and seedlings. Gradually, an identifiable collection was reborn. Look for the new engraved labels on each plant, a long-term evaluation of this collection, and ratings of the merits of each cultivar. Sara Millar planting the Terrace Stair Cascade garden. Near the McSwain Center we have installed a vibrant, colorful planting of (mostly) tender perennials in the Terrace Stair Cascade garden – the beds surrounding the Zone 8 Greenhouse/Gift Shop. A long sweep of purple sugarcane (Saccharum officinarum 'Pele's Smoke') is terminated by the tropical Ensete ventricosum 'Maurelii', which now appears in several Cary area tender perennial plantings. Other plants featured include the Sweet Caroline ornamental sweet potatoes developed here at NCSU, copper plants, bulbines, ornamental peppers, and elephant ears. Future work with more "permanent" plantings will see us locate half-hardy plants under the shelter of the Zone 8 Greenhouse. Included will be cycads, palms, and other plants not quite hardy here in Raleigh's Zone 7 climate. Cooperation with the North Carolina Palm and Exotic Plant Society should result in a truly exciting palette of plants. Stay tuned! The two beds located at the east end of the Perennial Border are coming to the end of an era. Yes, that's right. Much as any ecosystem goes through a succession of grasses to shrubs to trees, these beds are in their final year of tender perennial status. Sara and Jon spent the better part of a day this past June filling this area to the gills with an assortment of tender perennials. The goal for 2003 in this area is color, color, color. Look to 2004 for continuing development of this bed. Until then, complimentary color combinations of Salvia 'Purple Majesty' and Leonotis ocymifolia; Pavonia lasiopetala 'Bubba' and Verbena 'Laura Jackson'; and Duranta erecta 'Goldleaf' and Centrantherum camporum will be there to greet you as you visit The Necessary. Anne Calta (left) and Jon Roethling (right) plant the District X Garden Clubs Wall Garden. 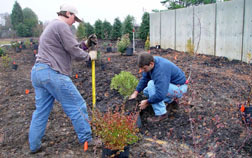 While 2003 has brought many opportunities for planting in the West Arboretum, many other areas of the Arboretum are in a state of renewal including the Mixed Border, Lath House, and the Klein-Pringle White Garden. As plants have grown and filled out in these areas, decisions were made with respect to retaining plants, pruning, or total renovation of some areas. The Mixed Border houses a number of plants that for all practical purposes have outgrown the confines of the Border and either must be removed altogether or transplanted to other areas of the Arboretum. With the help of the Mixed Border crew, led by Amelia Lane, the task of root pruning several specimens in the Border in preparation for transplanting to other areas this fall began in early June. Among those plants being root pruned are the Cercis canadensis subsp. texensis 'Traveller', Viburnum luzonicum, Stewartia serrata, and Corylopsis glandulifera var. hypoglauca. Watch for these to reappear elsewhere in the Arboretum in the fall. Expect to see many changes in the Lath House in the coming year, both structurally as well as to the plantings. Todd and Jon have selected many plants which have "proven themselves" in terms of cold hardiness and landscape toughness and are ready to move beyond the shaded protection of the Lath House. Look to see many of these old friends showing up in new places throughout the Arboretum. Coupled with these transplantings, expect to see a new influx of plants into the Lath House. Plans are also in the works for expansion in many directions so keep an eye out as this icon of the Arboretum begins to evolve. Finally, perhaps the most daunting task involving established areas in the East Arboretum is the renovation of the Klein-Pringle White Garden. After many conversations between Todd and Jon on the best way to spruce up this garden, the consensus reached was that total renovation of the garden is necessary. In some areas this was due to the fact that bamboo had become entrenched in certain areas and the only way to eradicate it is through complete removal of plant material in those areas. Likewise, we're undertaking the same drastic measures for removing the Petasites and Houttuynia, which have also crept throughout parts of the White Garden. Despite all the holes created by the removals, color was maintained through generous donations of summer annuals from Fairview Gardens (Raleigh, NC). This fall will see plenty of activity in terms of revitalizing the plant palette in the White Garden. Also, please go and see the beautiful new planting box designed and built by JCRA Volunteers Wayne Friedrich, his son Carl Friedrich, and Tim Hinton under the entry arbor to the White Garden. This planter will allow our beautiful specimen of Cedrus atlantica 'Glauca Pendula' (weeping blue Atlas cedar) to continue prospering as a feature plant for the White Garden. Earlier this spring, Jon was able to head out on a week-long trip down through South Carolina and into the Atlanta and Athens areas of Georgia. The primary goal of this trip was to start showing the Arboretum's face again in some of the areas that had unfortunately fallen by the wayside in the last few years. Also of high priority on this trip was to begin getting some of the great plants that are here at the Arboretum out to the industry. Todd and Jon spent serious time putting together appropriate groups of plants for each nursery that Jon planned to visit. Since Jon never turns a new plant down, the truck didn't return empty, either. Many a hotel manager got a great laugh as Jon would unpack and repack the truck each night in the parking lot to maximize space for plants to be received from the next day's nursery visits. "Thank goodness for that time spent, though" Jon says, as he returned with the truck packed with well over 150 new accessions for the Arboretum. Nurseries visited during this journey included Gilbert's Nursery (Chesnee, SC); Head-Lee Nursery (Seneca, SC); Transplant Nursery (Lavonia, GA); Itsaul Plants & Saul Nurseries (Atlanta, GA); Bold Spring Nursery (Monroe, GA); Griffith Propagation Nursery (Watkinsville, GA); Mike Dirr, Ph.D. (Athens, GA); McCorkle's Nursery (Dearing, GA); The Center for Applied Nursery Research (Dearing, GA); Dudley's Nursery (Thomson, GA); Woodlanders Nursery, Inc. (Aiken, SC); and Nurseries Caroliniana (North Augusta, SC). Many thanks to the generosity shown by everyone involved, both in plant material shared and more importantly in the time spent walking, talking, and learning. Sara Millar (left and hiding behind tree) and Jon Roethling (right) plant a Japanese maple near the future pathway linking the Cascade stairway and the Southhall Memorial Garden. 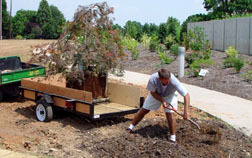 Many other projects are underway on the Arboretum grounds. From creating a new pathway linking the Cascade stairway and the Southhall Memorial Garden to determining the boundaries for the new bed west of the McSwain Center, using the geothermal well field as a central grassy area, there is much to do. Then there's the small matter of moving the Southwest Garden from its present location ("flood central") to nearer the extended Perennial Border. Also, expect to see dozens of samples from the overcrowded conifer collection, plus those being held in our field nursery or holding beds, as we showcase them in new ways. Stay tuned for all the excitement in the future at the JCRA! Sunday, May 4, 2003 – Gala in the Garden – what a great day! The weather was perfect, the atmosphere upbeat, and the auction exciting. This year's Gala was one of the most beneficial for the Arboretum in both friend-making and fund-raising. Hundreds of guests enjoyed the beautiful day and socialized with old and new friends. Among those attending were Smedes and Rosemary York, Honorary Chairs. Many thanks to them for their efforts! Also attending were many of the Gala's corporate sponsors and their guests. Without the generosity of these wonderful companies and individuals, the Gala would never be as financially supportive for the JCRA. Listed below are those who chose to support the Gala as corporate sponsors. Please be sure to add your thanks to ours as you see them. In addition, we always have a long list of folks who make special contributions to the Gala, be it of time, talents, or monetary gifts. My apologies to anyone inadvertently omitted. In case you missed this year's event, here are some of the highlights. The decorations this year were fantastic. First of all, Mother Nature, who should be the first name on the committee list, cooperated beautifully. The gardens were at their spring peak and the weather quite satisfactory. Shelley McCain and her crew had put in many long hours working with the decorations (special thanks to the Mushroom Crew!) and the Arboretum was spectacular. Wonderfully funky decorations included huge mushrooms, frogs, flying "critters," and bowls of live gold fish, and flags and windsocks fluttered in the breeze. All eight auction tents were filled to capacity, ready to entice bids from the guests. Amy Veatch, Jan Wilson, and the rest of the committee really outdid themselves. And the plants! Special thanks to Todd Lasseigne and Jon Roethling for their work in filling four of the tents with more plants than you can imagine. There was something for everyone! With the delicious food prepared by Lady Fingers Catering and the beverages provided by Lou Pucillo, Inc., Leo & Helen Daughtry, Kay & Bill Kennedy, Michael Osborne & Napa Ridge Winery, Mutual Distributing Company, and John Harris - Harris Wholesale, everyone was sure to enjoy themselves. When the last auction tent closed, everyone was asked to adjourn to the York Auditorium in the Ruby C. McSwain Education Center for closing remarks. Director Bob Lyons, Chancellor Marye Anne Fox, Dean Jim Oblinger, Smedes and Rosemary York, Phyllis Eller-Moffet, and Kara Bertoncino were among those who spoke. An announcement was made regarding Harvey Bumgardner's gift to the JCRA and to finish off the evening, the special drawing lucky ticket was drawn for the winner of the naming rights to a $5,000.00 pocket garden at the JCRA. The winner was the Pioneer Garden Club in Hickory, NC. Soon after, the guests began the fun of packing their highly sought auction items into their cars and heading for home. Sounds like a great party, huh? Well, it really was, so mark your calendar for Sunday, May 2, 2004, and plan to be with us next year. Maybe we'll just outdo ourselves again – you never know! 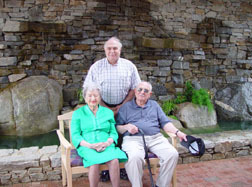 Charles (Chuck) Manooch, III, Ph.D., (standing); Annie Laurie Williams (left); and Charles Manooch, Jr. (right). 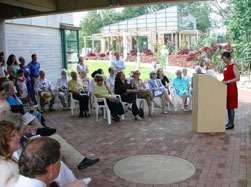 Chancellor Marye Anne Fox speaking at the dedication ceremony for the Margaret Snow Manooch Cascade on August 17, 2003. There is a beautiful spot at the Ruby C. McSwain Education Center – the Margaret Snow Manooch Cascade. Arboretum visitors are greeted by the Manooch Cascade's tranquil beauty and peaceful sounds; its beauty is matched only by the beautiful tribute that it represents. Annie Laurie Williams is the very special lady who helped create this extraordinary memorial to her niece, and the plaque located beside the cascade says it all..."In memory of the life and spirit of Margaret Snow Manooch." Thank you, Mrs. Williams, for this wonderful gift of love! Below: Chancellor Marye Anne Fox speaking at the dedication ceremony for the Margaret Snow Manooch Cascade on August 17, 2003. .....Now this is something worth "digging" into! Don't let the current environment of low interest rates "wilt" your spirits. Put some of your cash or appreciated securities into a charitable gift annuity with the JCRA. These irrevocable contributions pay a fixed annuity for life that's guaranteed – and also provide a 2003 tax deduction. The benefits for a $10,000.00 gift are shown below. *The annuity rate and tax deduction are somewhat lower when two annuitants are designated. What better way to provide for the JC Raulston Arboretum's future and your own? For more information, contact Anne Porter, (919) 513-3463, or Joan DeBruin, (919) 515-9076. 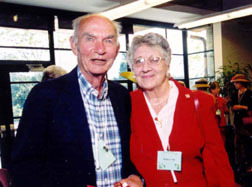 Harvey Bumgarder (left) and Helen Crisp (right) at the 2003 Gala in the Garden. The JC Raulston Arboretum has thrived for all these years due mainly through its memberships and private donations. At the same time, it probably would not have survived, or at least not have earned the outstanding reputation that it has today, without the thousands of hours that its loyal volunteers contribute each year. I want to tell you about one of these very special people and the extraordinary difference one person can make – Harvey Bumgardner, Ph.D.! Throughout Harvey's distinguished career as a NC State professor of Poultry Science, he made many contributions to the University and to the poultry industry. In addition to these achievements, Harvey has given freely of his talents to local theater and to the horticultural community. He is renowned for his expertise as a rosarian, and he is responsible for bringing roses to countless gardens in historic Oakwood and other areas of Raleigh. Harvey is the founding rosarian for the Arboretum's Finley-Nottingham Rose Garden, and he has been its volunteer curator since its inception. A little over a year ago, he coordinated the effort to completely restore the Rose Garden, and we all enjoy its beauty today. 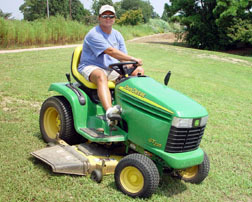 Harvey has given countless volunteer hours of service to the Arboretum, and to further demonstrate his commitment, in 1998, Harvey established an endowment to support the JC Raulston Arboretum. If that was not demonstration enough, last February, Harvey gave a significant gift of real estate as a charitable gift annuity with the balance going into his unrestricted endowment for the benefit of the Arboretum. Harvey, thank you for your time, your talents, and your monetary support. You have demonstrated again and again how one person can make a big difference! You are an inspiration for us all! JCRA Naming Opportunities - From $5,000.00 to $500,000.00. A Permanent Endowment - Create a gift that will live on in perpetuity. There are many options, such as the JCRA Endowment, internships, and educational opportunities. A Planned Gift - There are many options for planned giving - bequests, annuities, land gifts, and trusts - just to name a few. A planned gift is a win-win for both the donor and the Arboretum. Please read "Guaranteed Fixed Income" at the top of the left column to learn more about charitable gift annuities. Unrestricted Gift of Cash or Stock - Always needed to maintain the general operations of the JCRA. For more information on giving opportunities, please contact Anne Porter at (919) 513-3463 or <anne_porter@ncsu.edu>. There is something interesting about to happen in the Priscilla Swindell Contemplation Garden. Keep your eyes open and watch for an exciting partnership! This has been a terrific season for the gardens and the same can be said for the events and activities that have wholeheartedly been supported by the JCRA Volunteers! As always volunteers contributed their time, energy, and talents to assure success...making the JCRA an even better place! Here are some photographs that show the volunteers in action. Barbara Kennedy (right), Tour Guide, shares the wonders of the JCRA in winter at the "A Walk in the Winter Garden" with a group of visitors. The Volunteer Tour Guides led tours for more than 200 visitors. Walt Thompson (left), Volunteer, shares information with "A Walk in the Winter Garden" visitors. Claude Caldwell (right), Tour Guide and Reception Desk Volunteer, teaches a group of children about the flowering Poncirus trifoliata 'Flying Dragon'. Kathleen Thompson (left), Volunteer, arranges flowers and foliage for a special event in the Ruby C. McSwain Education Center. Hundreds of volunteer hours went into preparing for the Gala. 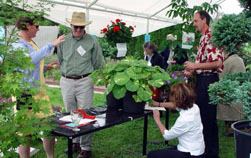 Here, Marty Howard (right), a new Volunteer, moves plants to the silent auction tents. The fruits of their labor sure paid off! Did you see the meadow garden leading to the rooftop area? A group of volunteers got together the first week of April and under the direction of Bob Lyons planted a special mixture of annual seeds. 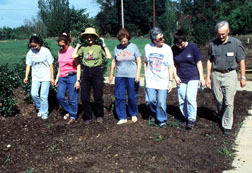 The whole gang (left) is shown walking across the bed to make sure that the seeds come in good contact with the soil. From right to left they are: Qian Wu, Kathy Hafer, Barbara Kennedy, Elaine Pace, Donna Maroni, Donna Moffett, and Wayne Friedrich. Wayne (right) spreads the seed. Wayne Friedrich put his carpentry skills to work once again for the JCRA! 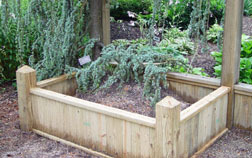 Wayne, with help from his son Carl Friedrich and volunteer Tim Hinton, constructed a new root box (right) for the weeping Cedrus atlantica 'Glauca Pendula' in the Klein-Pringle White Garden. Over 70 volunteers (left) enjoyed the mid-July Volunteer Appreciation Luncheon.